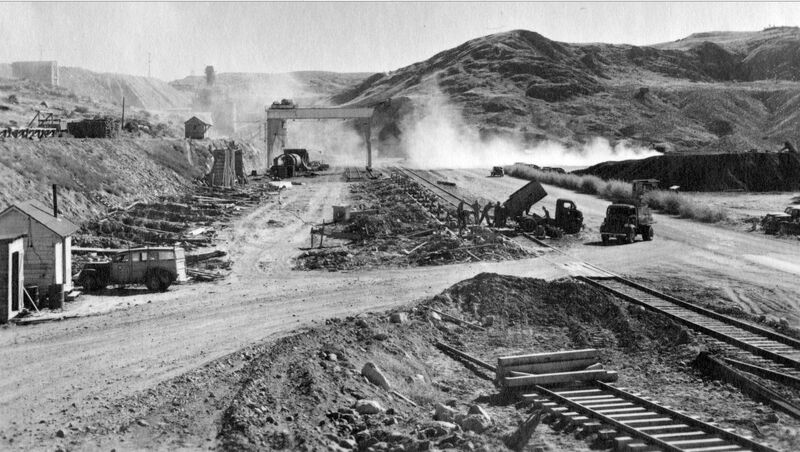 The Industrial Area, the current site of the secured shop buildings for Grand Coulee Dam, was formerly known as the Vista Storage Yard -- the site of the unloading area of bulk cement, among other things. It’s transformation into what we know it as today began in 1942 with the construction of what was called the Assembly Building. Also called the Utility Building, the Assembly Building’s initial function was to facilitate the assembly of powerhouse units and other heavy equipment. A secondary purpose was to provide storage space. The site for the building was slightly southwest of the cement unloading area. To accommodate the building’s construction, both the main rail line and the spur line to the cement plant were relocated. A new spur was installed on the interior of the building, running its entire length. Excavation for the structure began in January 1942, but was temporarily suspended about a month later when equipment and crews were needed elsewhere. The excavation was completed between April and July of that year. Placement of the footings for the southeast wall started in June. In the same month, a 75-ton gantry crane was installed with tracks sixty feet apart, running the length of the building and into the steel storage yard to the north. The crane had originally served the Bureau of Reclamation’s storage and shop facilities in Electric City. The crane was not the only recycled component of the building, a thriftiness forced by wartime rationing of construction equipment and materials. The building’s framework was made of steel salvaged by Bureau forces from a Great Northern Railway (GN) bridge upstream from the dam site at Marcus, which would be flooded as the reservoir rose behind the dam. 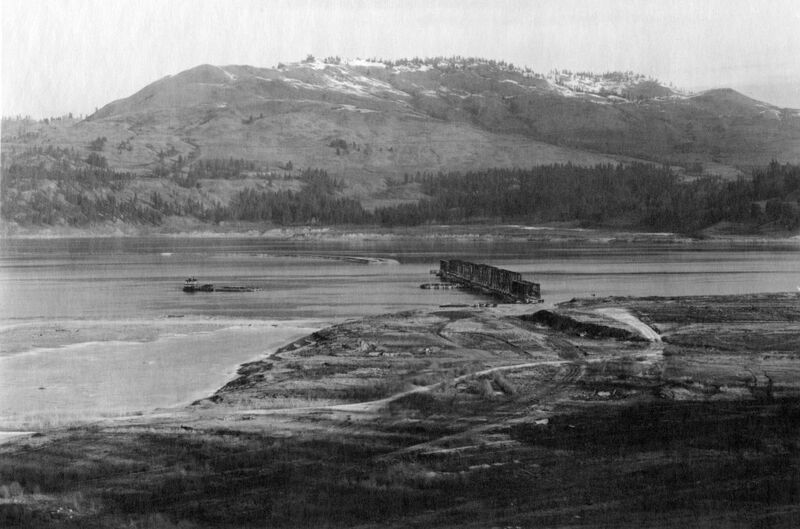 The GN had abandoned the bridge in 1941, in favor of a newly-constructed span nearby at a much higher elevation. Additional steel for the building was obtained from another bridge. An erection diagram prepared by Bureau engineers notes that “columns in Bents 1, 2 and 15 are made of small members (19" deep) from 225' bridge” and “columns in bents 3 to 14 inclusive are made of large members (21" deep) from 253' bridge.” Bridges and other structures were also mined for timbers, which were sawn into lumber for the building. 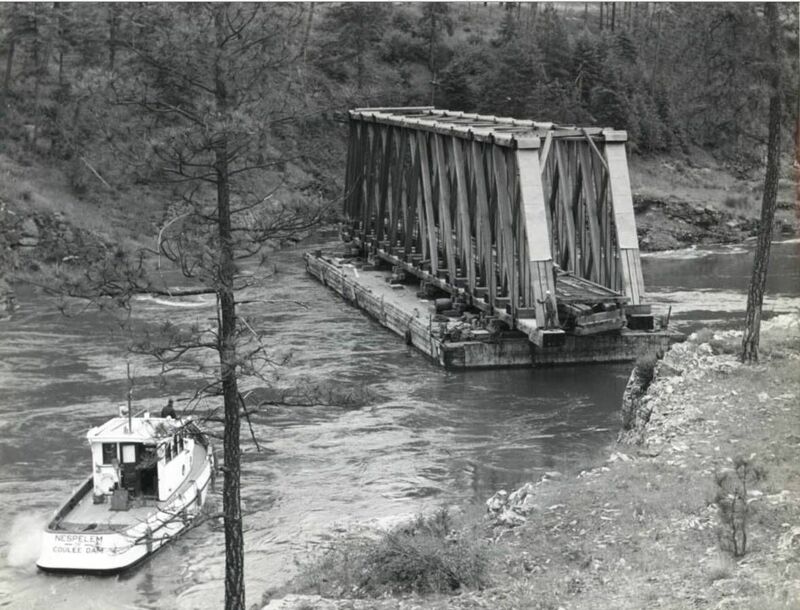 After the bridge had been fully turned over to the Bureau for disposal, the Great Northern discovered they needed to retain a part of the Marcus bridge, and in turn offered the Bureau $10,000 for a span, which they used to replace a section of their bridge over the Pend Oreille River at Waneta, BC. 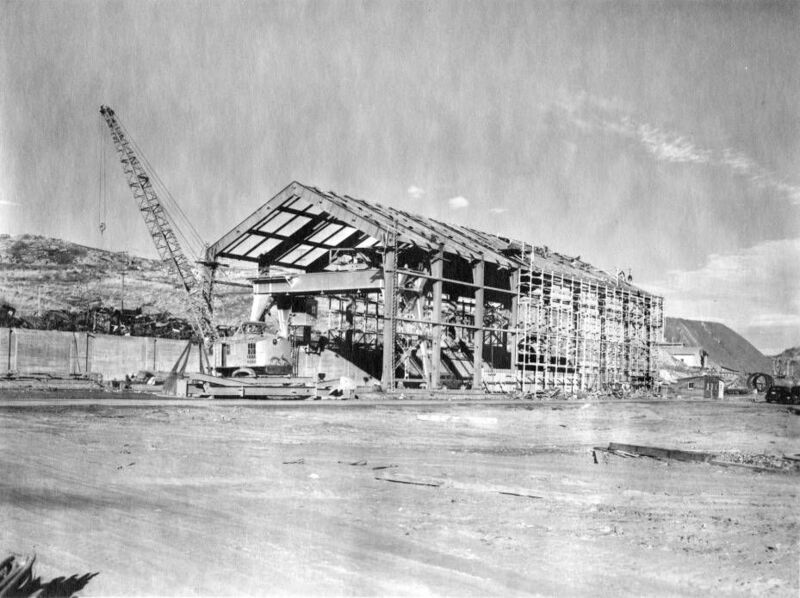 Completion of the Assembly Building remained a low priority, but by the end of March 1943, the roof and walls were in place. By the end of the year, utilities were installed and the building was essentially finished. The exterior of the building is largely the same today, though the interior has changed from time to time to suit current needs. To provide additional shelter and space while constructing the components for the powerhouse units an off-site assembly point was constructed. 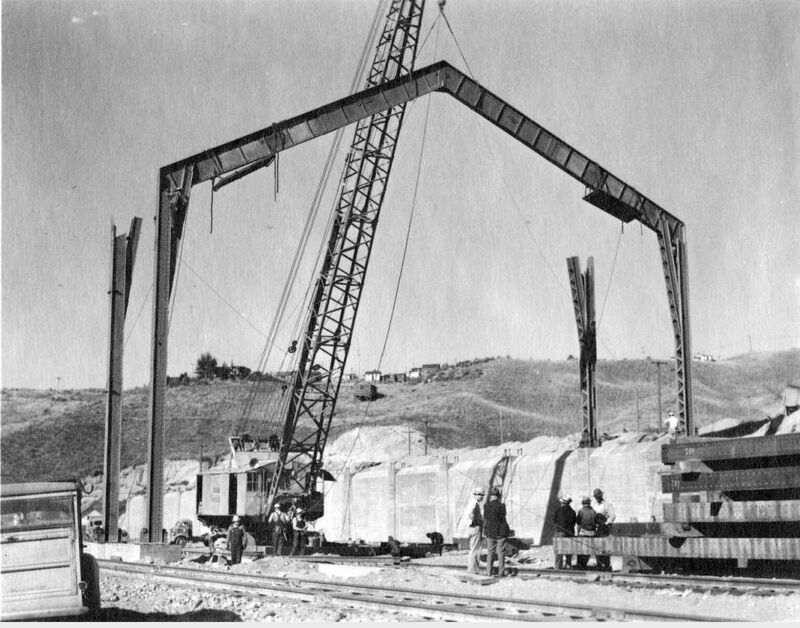 1942-08-29 Erecting some of the steel reclaimed from the Marcus bridge in the assembly building along the railroad, near the cement silos. To expedite the assembling of new turbine and generators and to store government equipment, the Bureau of Reclamation is constructing a large assembly building on the west shore, upstream from the dam. The structure ultimately will be 357 feet long, 68 feet 11 1/2 inches wide, and 65 feet high at the gable. Only about one-third of the building, seen here, is being erected at present. Steel girders salvaged from the old Great Northern Railway bridge, that crossed the Columbia River at Marcus in the Grand Coulee Dam reservoir, from the framework for the structure. A shingle roof, and walls of drop-siding are to be added. The area behind the concrete training wall, a portion of which can be seen at the left, will be backfilled to hold a railroad spur. Likely the longer gray-roofed building seen here. The motor barge Paul Bunyan moving barges into Marcus bridge. 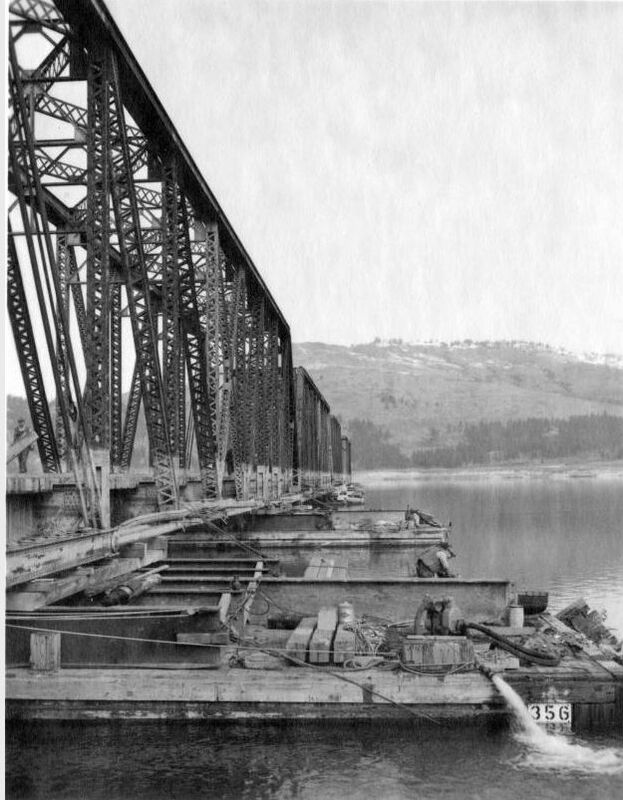 The bridge spans were moved, one at a time, to Coulee Dam, to salvage the wood and steel in them. This is a scene during the operations of moving the steel spans of the old railroad bridge from marcus, Wn. to Coulee Dam in February of 1942. Note the high water mark on the bridge trusses indicating the height to which the water in the reservoir had risen during the previous flood stage. Here are listed possible storage sites on the Columbia River drainage above Coulee Dam, and which will probably be developed in efforts to increase the firm power of the river. Hungry Horse-)--1,100,000 Acre-feet. Flathead Lake-" 1,540,000. Pend Oreille Lake-)--1,620,000. Priest Lake )--569,000. Kootenay Lake-)--715,000. Coeur d'Alene Lake-" 430,000. Total-)--5,974,000. The use of this storage would increase the minimum low-water flow at Grand Coulee Dam from 17,000 second-feet to 32,900 second-feet. 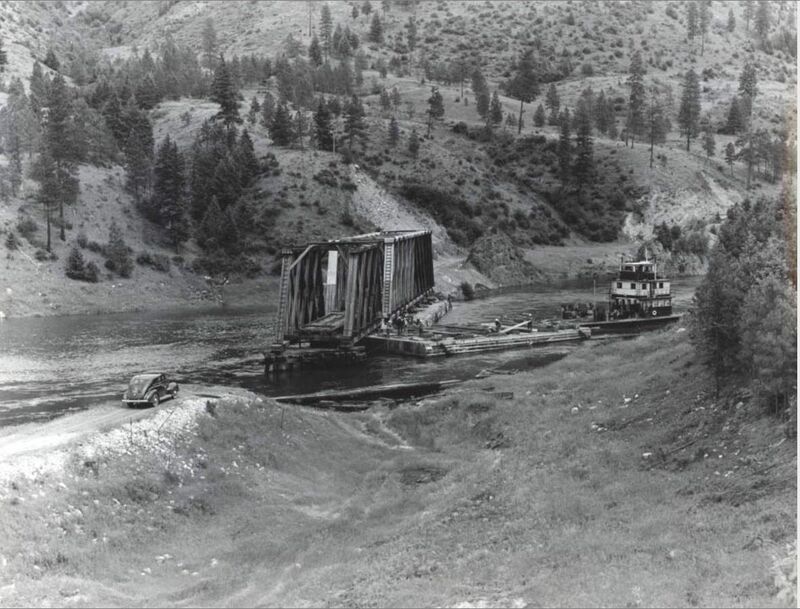 By June of 1942 the rising waters of the reservoir had backed the Kettle River up to a sufficient depth to permit removal of the Kettle River railroad bridge by barges and tugs. Here the power tug Paul Bunyan is maneuvering a barge under the last span. Bridges such as these were salvaged for their lumber and steel as supplies of both had become tight due to World War II. The U.S.B.R. would drive barges under the bridges, fill them with water to fit under the span, then gradually pump the water out till the barge supported the weight of the bridge in question. Pumping out barges under a steel span of the abandoned Great Northern railroad bridge at Marcus in order to float the span off the piers. The high water mark of the preceding season is shown by the white coating on steel. Great Northern Railway Relocation- Removing old railroad spans over Kettle River, near Boyds. View of "Paul Bunyan" coming down Kettle River gorge, upstream from the new county and railroad bridge crossings. Great Northern Railway Relocation- Removing old railroad spans over Kettle River, near Boyds. View of "Paul Bunyan" coming down Kettle River gorge, upstream from the new county and railroad bridge crossings. 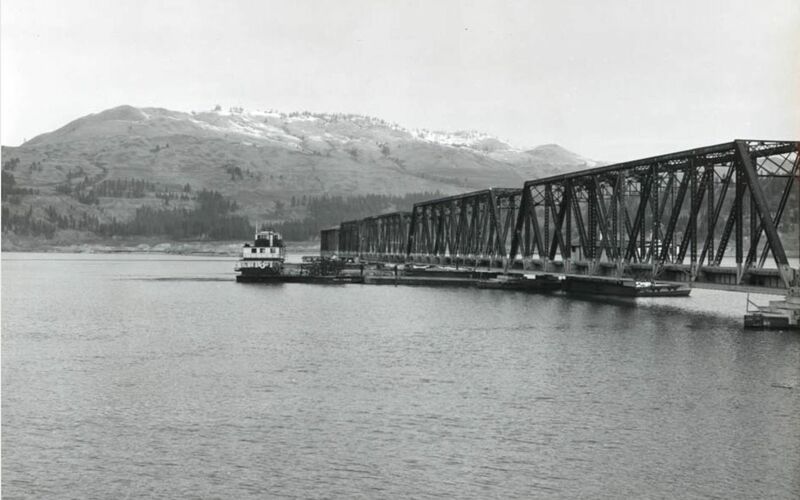 A wooden span from the Marcus bridge arriving at the Coulee Dam under tow by the power barge "Paul Bunyan." 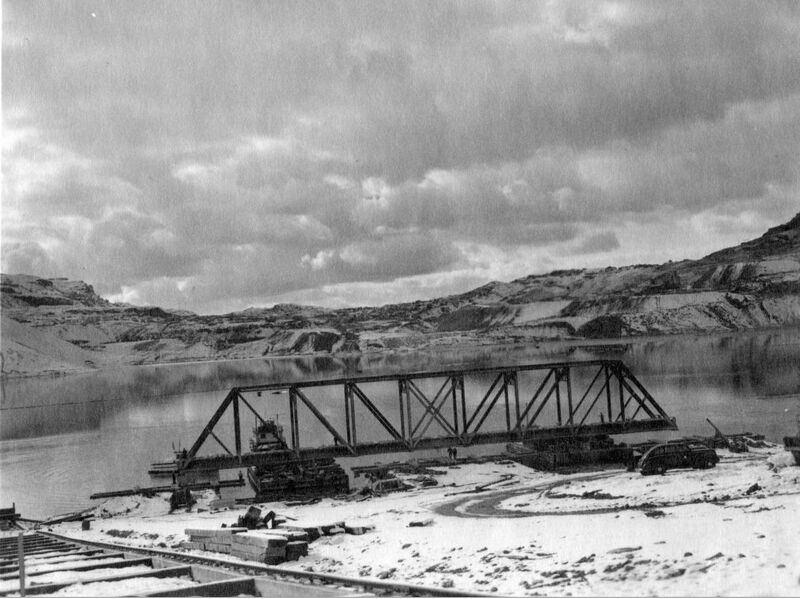 1942-02-21 Landing a Marcus bridge span from barges, in specially prepared slips at Coulee Dam.